Chideo, the first charity broadcast network, has partnered with GRAMMY-nominated recording artist Flo Rida to make dreams come true for his fans and for inner-city kids. As a Chideo Celebrity Ambassador, Flo Rida will be creating exclusive content and one-of-a-kind experiences for the platform in order to raise awareness and funds for his charity, Big Dreams For Kids. Big Dreams for Kids and its signature program, the Florida Youth Football League, is committed to instilling honesty, loyalty, integrity, teamwork, discipline, sportsmanship, respect, leadership, trust and commitment in all participants. •	Get Flo Fit with Flo Rida: For $20,000, the donor and one guest will receive the opportunity to work out with Flo Rida. Travel and hotel included for a 1-night trip to Miami. •	The Ultimate Flo Rida Insida Experience: For $50,000, the donor spends the day on set with Flo Rida and receives the opportunity to appear in his next music video. Travel and hotel included for a 2-night stay in Miami. Fans who aren’t able to purchase one of these “buy it now” packages can donate to the non-profit on Chideo for a chance to win the Ultimate Flo Rida Insida Experience, including the walk-on role in the rapper’s upcoming music video. Fans earn one entry for a $10 donation, with additional donations generating even more chances to win. In addition to multiple contest entries, donations of $25 or more will receive a digital thank you from Flo Rida; donations of $50 or more receive a poster and digital thank you; donations of $100 or more receive a t-shirt, poster and digital thank you; and donations of $250 or more receive a hat, t-shirt, poster and digital thank you; and donations of $500 or more receive a Flo Rida Flo Fit workout video. 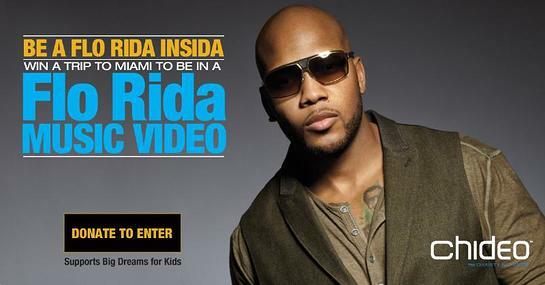 Those who donate $5,000 to Big Dreams for Kids will get to video chat live, one-to-one, with Flo Rida. The deadline to enter the Flo Rida “Insida” Fan Experience is 11:59 p.m. PST on March 2, 2015. For complete details (including free entry method) and to register for a chance to win, please visit Chideo.com or download the free Chideo app, available for iPhone, iPad and iPod touch at www.appstore.com/chideo, and for Android devices here. For up-to-the-minute news and announcements from Chideo personalities, please follow Chideo on Facebook at Facebook.com/chideodotcom or on Twitter @chideo.